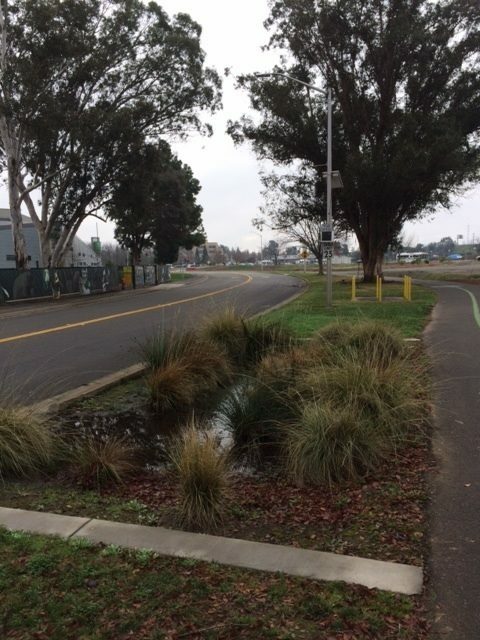 Green infrastructure for capturing stormwater runoff on the campus of California State University, Sacramento. Urban stormwater systems traditionally used “grey” infrastructure to manage runoff. Contemporary designs now incorporate “green” infrastructure, which offers additional potential benefits such as urban amenities and health. Understanding how green and grey infrastructure investments are distributed across urban areas is important for new goals of promoting environmental justice in planning. This paper demonstrates an approach for identifying areas for new green infrastructure projects that simultaneously address engineering needs and promote equity. As stormwater systems are increasingly designed for multi-benefit outcomes, new design frameworks must emphasize multi-benefit projects.